This article covers the basic shooting modes found on most DSLR cameras. And, insights into shooting for the purpose of converting to High Dynamic Range. The article also includes information about general High Dynamic Range photography. (AUTO) The automatic settings on most DSLR cameras will generally set ISO, f-stop, shutter-speed and implement flash when required. We use AUTO when it isn't possible to run through your settings at speed and decide which combination best suits the environment. Such as, "happy-snaps", photographing in crowds, moving objects and animals, etc; in situations where shutter speed and depth of field (DOF) is not that important. 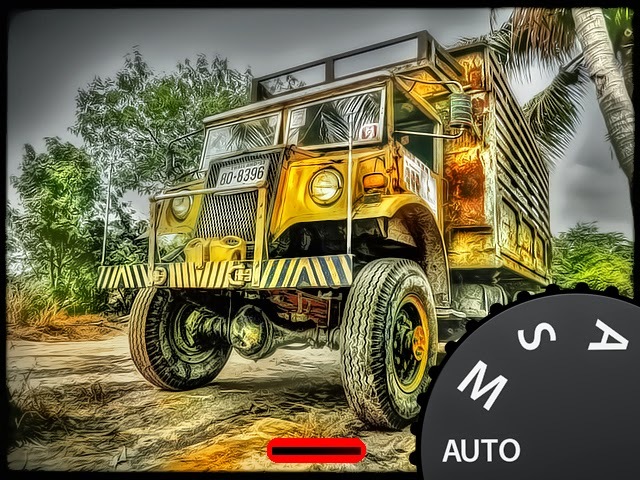 Generally, the AUTO setting shoots for a crisp clear image based on point of focus. It can be used with single shot High Dynamic Range (HDR) photography, where one might plan to split the resulting image into three separate exposure values (EV) in post processing. However, AUTO has its limitations: In situations where the photographer wants control over the cameras functions. For example, where multiple exposures at differing exposure values (EV) are required for High Dynamic Range imaging it's use is not recommended. Shutter-Priority (S) The shutter-priority setting on your camera is used in situations where shutter speed is most important. The camera will set-up the ISO and aperture (f-stop) for you. This setting is best used in sporting events; in situations where one requires the cameras shutter speed to be set to capture fast moving action shots. Or, long exposures where we would like to create atmosphere within our shot - the blurring effect of moving water over rocks is a good example. I personally tend to use this mode when there's not quite enough light to shoot in Aperture-Priority. Nevertheless, this setting is more specialized, and for use in more general photography my preference is that of Aperture-Priority. Shutter-priority can be a very effective means of capturing great mood shots. Aperture-Priority (A; Av) Aperture Priority is a great general purpose mode. It gives you the ability to freely set your cameras ISO speed and scroll through f-stop to set your depth of field on the fly. The camera will select the right exposure for your image based on the ISO and f-stop selection to produce a well exposed shot. I find Aperture Priority to be the most useful camera mode in respects to my current needs. It covers a wide selection of photographic conditions. However, if the cameras ISO speed is not selected correctly for the light conditions, or one forgets to change the f-stop values, your shots will not be exposed correctly. To the beginner who uses Aperture Priority incorrectly, this mode can produce poor quality images. Often reverting them back to using the AUTO mode. Note: After shooting a series of shots in this mode I tend to set my camera back to a general setting such as, f9 ISO400, in the event I forget to set the camera for the next shot and conditions. Leaving it set at a mid-point where it should take adequate all purpose shots. I hope this article helps you get to grips with my personal use of program modes for DSLRs. Please check-out some of my other articles to view examples of this process in action. If you are interested in purchasing a signed and certified print(s) please feel free to contact me.